I decided to seek help for my post natal hair and arrived at Yun Nam Hair Care for my early 11am appointment on a Sunday at the Plaza Singapura branch. I was really looking forward (and a little scared too) to finding out how’s my scalp condition 7 months post pregnancy. Post natal hair loss is not a thing to be taken lightly. ;( See when I was pregnant for 9 months, I had very thick and healthy hair. Every strand grew well, thick and strong. I had little to no hair loss, as is expected of pregnant women. But once I gave birth, the hair KEPT FALLING! But the scary thing is after giving birth, all those 9 months worth of hairfall will usually happen intensively when your child is 4-5months old. 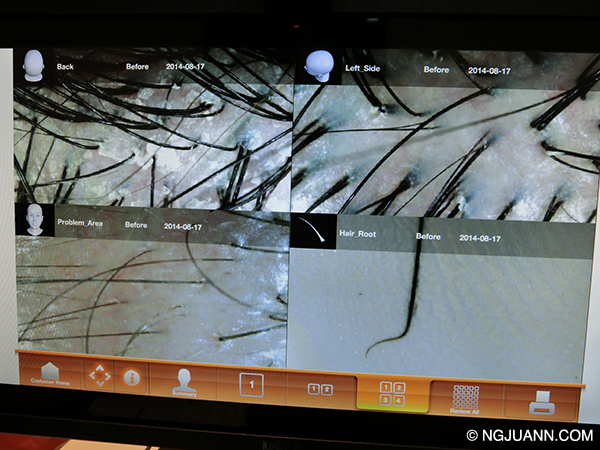 It is normal to lose about 100 strands of hair a day. So imagine 100 strands x 9 months worth. I remember when Daniel was 4 months old, I kept losing big bunches of hair. There was hair everywhere – on the floor, on my pillow, in my bathroom… While I knew it was normal, and expected, I couldn’t stop worrying or being upset about it. Now when Daniel is almost 8 months old, my hairloss has slowed down and I am starting to see a lot of baby hair at the hairline along my forehead. Caely, my hair stylist at Shunji Matsuo @ 313 Somerset, commented the other day on how come my fringe area had so many baby hair but my top didn’t. I wasn’t sure why either… Could it be that my hair wasn’t growing?! $2,000 at Yun Nam Hair Care will get you 10 sessions of customised treatments that will help to address your hair/scalp problems. For me, it was the need to grow my hair since my crazy hairloss has slowed down. Top left: This is showing the back of my scalp. It is dry with a lot of dandruff on the scalp. There’s still quite a fair bit of hair in every pore in this area. Top right: This is showing the left of my head. Here, it is oily with less hair strands and my scalp is unhealthily covered with a layer of dandruff too. You can also see a few strands of hair which are thinner than others, indicating a lack of nutrients, likely due to breastfeeding. Bottom right: This is a new strand of baby hair that Belinda pulled out from my fringe hairline. She needed to see how healthy my new baby hair roots are. It was unfortunately very weak. It should be a strong thick root but what I have here is a thin curly root which will cause my hair to fall off sooner than it’s intended life span. Oh gawdddd…. Bottom left: This is my problem area. It looks like this to the naked eye. My post natal hair loss problem is quite bad because even to the naked, untrained eye, you can see that my hairline has patches with sparse hairs. 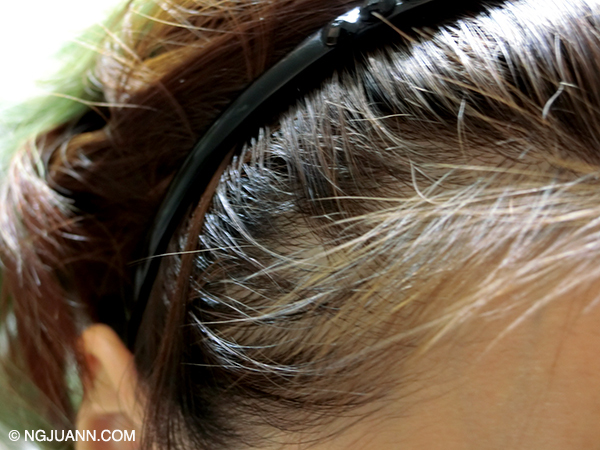 Belinda said that my scalp here is severly oily. The hair tonic that I’ve been putting religiously doesn’t even have the opportunity to be well absorbed in because the pores on my scalp are all covered by oil. And the hair tonic may have made my hair grow (the baby hair) but it’s not getting enough nutrients which explains why the roots of my new hair are thin and curly. I was pretty distraught already. 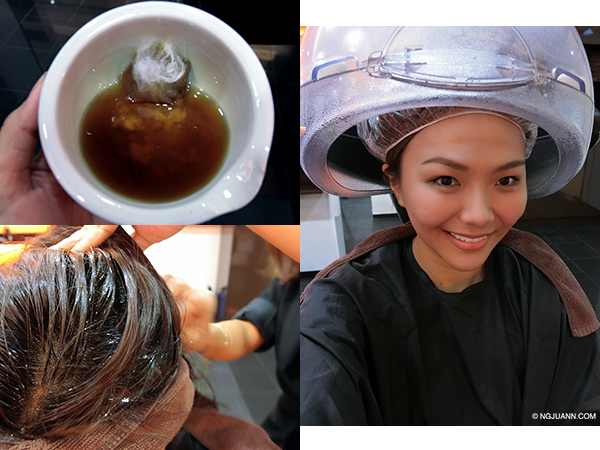 She assured me that the scalp treatment would help to make my scalp a healthier place for hair to grow and thrive in. My treatment plan for my post natal hair loss problem would be a series of weekly herbal hair treatments for the scalp that will alternate between cleansing and regrowth. It will be a total of 10 sessions. My first treatment aims to cleanse the scalp thoroughly so that hair may grow and absorb the hair tonics that I put on my scalp. Here’s how it went down. Belinda, my consultant, made a Sesame Oil and Ginseng Powder blend and applied it to my scalp. She then massaged it all in and steamed my hair for 30mins. 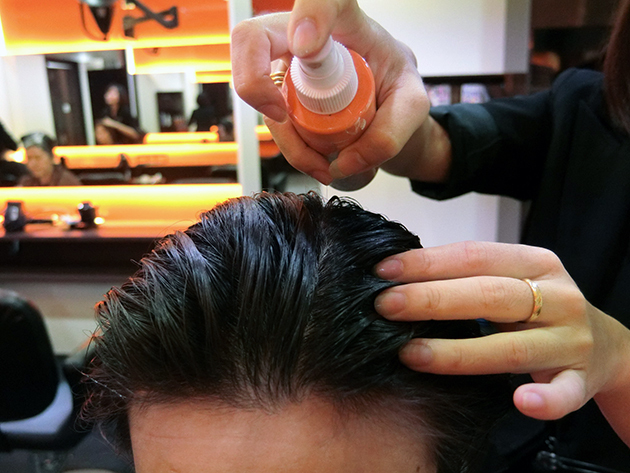 This step is customised to help soften dandruff from my scalp. I will also need to compliment it with the following hair products for home use. 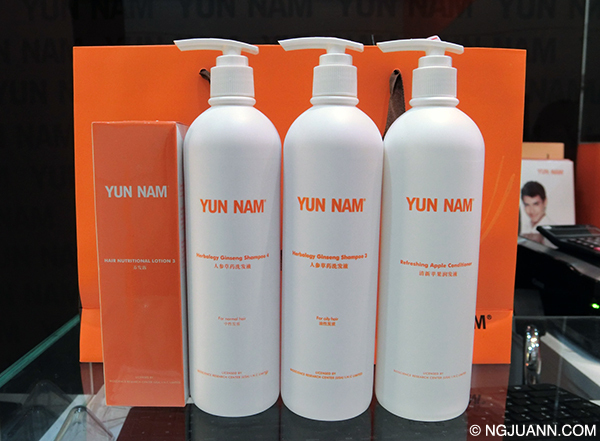 I’m really excited about this because what sets Yun Nam Hair Care apart from the others is the use of their 100% herbal formula that consists mainly of ginseng extracts. Moreover Yun Nam Hair Care has been awarded the No. 1 Recommended Brand, Most Effective Brand, Most Trusted Brand and the No. 1 Recognised Hair Care Brand in Singapore in the prestigous Superbrands Awards 2008 – 2010 and 2013. 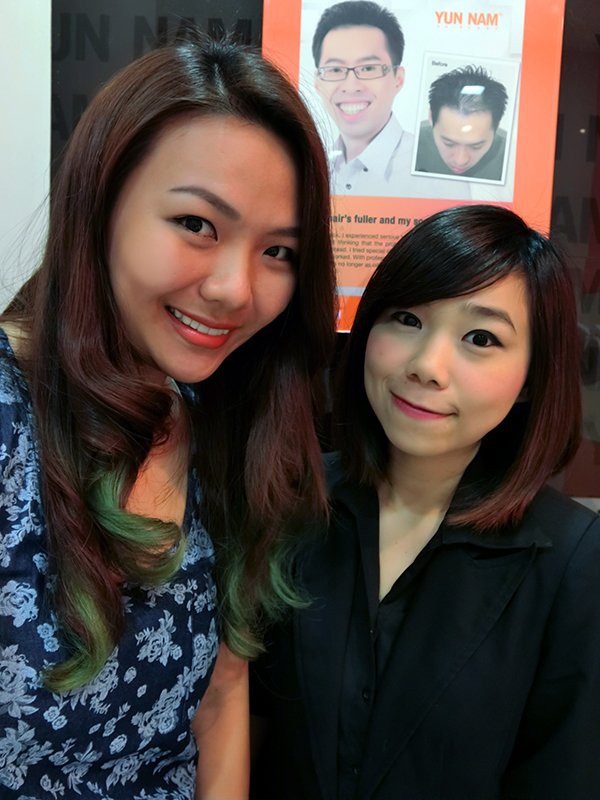 If you intend to check out Yun Nam Hair Care at Plaza Singapura for your post natal hair loss problem, do ask for Belinda. She’s extremely knowledgeable and answered all the questions I had on haircare and even proper habits and nutrition to improve my hair problems. Well, now that you know more about Yun Nam Hair Care, don’t just take my word for it. 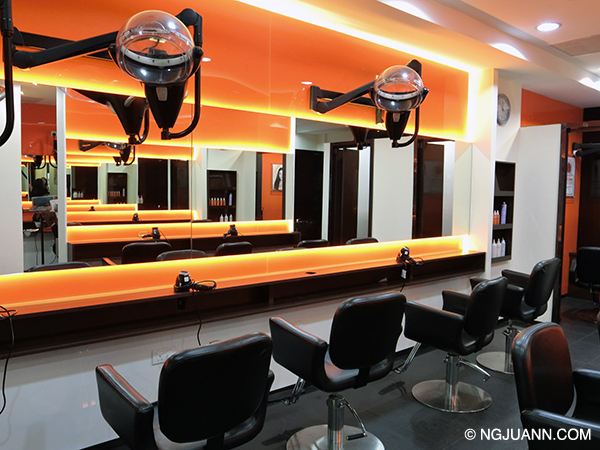 Go for a free trial at Yun Nam Hair Care here! Previous Post Do Slimming Body Wraps Like These Work?